The subject of coaching has become increasingly popular in recent years. Its focus is principally the supervisor-worker relationship, the point at which value-creating work is performed. Coaching is normally ex post facto, meaning that it begins after an organization has embarked on its Lean transformation. It makes sense to do that, but much more must be done. Coaching should extend to the highest levels of an organization, preferably ex ante, before the Lean transformation begins. Leading in same ways that they have always led, and thus failing to recognize Lean as something totally different from what they know and do. Allowing some parts of the organization and their leaders to completely ignore Lean principles and practices. Delegate Lean practice to consultants and lower level people signalling that senior leaders have nothing new to learn. Failure to connect Lean to both strategy and employee learning and development. All of this occurs within the framework of seeking to improve short-term financial results. It is a remarkable failure to apply what one has repeatedly learned how to do in school: Conduct research to learn about something that you know nothing about. A terrible assumption is made by leaders: Because they know conventional management, they know Lean management (and, by extension, because they know conventional leadership, they know Lean leadership). 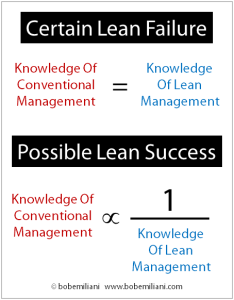 The reality is that the more one knows about conventional management, the less one knows about Lean management. This inverse relationship helps us understand why most Lean transformations fail or fall short of expectations, frustrating leaders and workers alike. Simply put, leaders unwilling to learn are leaders unwilling to succeed. Typically, many years pass before top leaders realize their errors. Without admitting they made any errors, leaders seek to make corrections. This re-work may succeed, but at a great cost in time and leadership influence and credibility. Obviously, there is a need to coach top executives starting on Day 1, or preferably before they commit themselves to Lean management. But, what should they be coached on? Should they be coached on the technical aspects of Lean tools and Lean production, the overall Lean management system, or something else? While necessary, coaching leaders on technical details are insufficient given the mode by which leaders fail. Further, nested of cycles of coaching (the fractal nature of coaching) is disrupted because senior leadership teams need to be coached in specific things that people at lower levels do not. Economic – Short-term financial focus. Social – Separation between leaders and followers, as evidenced by leaders who have nothing new to learn while workers must learn and do new things. Political – Lack of leadership influence and credibility, the result of setting direction that one has no experience with and cannot speak to or do. Historical – The possibility that Lean management will fail, and the historical record that shows Lean frequently fails, including the principal causes of failure. Mental rigidity among the top leaders assure that current conditions are maintained and that the economic, social, political, and historical target conditions are never achieved. Leaders’ “basic way of thinking” about the economic, social, political, and historical aspects of business and processes improvement must first be diagnosed. Then, it can be corrected via coaching, preferably before an organization embarks on a Lean transformation. Why? Because knowing what is actually required will help them make an informed decision. Lean management will not be the right choice if leaders are unwilling to learn. Improving short-term financial results can be achieved in dozens of others ways. If leaders truly want to change from conventional management to Lean management, then the most critically important coaching for them involves detailed explorations of scores of economic, social, political, and historical aspects of business and processes improvement. You will find my Lean leadership coaching manual to be a tremendous resource to help you move towards the “basic way of thinking” target conditions necessary for Lean success. This means that the people selected to be senior leaders must possesses the basic characteristics necessary to lead a Lean transformation. And they must be willing to take instruction from the coach and do exactly as the coach says. Great insight, as always, Bob. If a large fraction of the relatively few non-Fake lean transformations we see in North America are the ones that Toyota’s supplier network pulled off in the 1980s and ’90s when they acquired and transformed local firms to support Toyota’s NA assembly operations, we might look to how they did that for inspiration. Of course they did precisely what you’re advocating – start by using leader-Gemba problems to scaffold coaching of the executive team and the managers immediately below in Toyota Way thinking and behaving. That this worked reliably is the good news. The bad news is that accomplishing this kind of transformation took a passel of seriously expert Japanese ex-pats something like a decade per transformation. From whence cometh our army and our coaching expertise and persistence? Your observation above “(Coaching’s) focus is principally the supervisor-worker relationship, the point at which value-creating work is performed.” brings Training Within Industry (TWI) to mind. During WWII TWI application in the U.S. rose no higher than the shop floor and, for all its success, withered rapidly after the war. In occupied Japan after the war, however, TWI extended upward into management and had a pretty decent run during the 1950s. So, to answer the rhetorical question about the source of our expert and persistent coaching army, let me propose TWI-21, Training Within Industry for the 21st Century. I am confident that a few tens of millions of dollars from the budget of the Manufacturing Extension Partnership (under the National Institute of Standards and Technology at the Commerce Department) would jumpstart a fine instructional and performance support system to get, say, 80% of the way. Once instantiated, such a system could also scale really well, just as TWI did. Who knows a U.S. senator with the ears for such a thing?